View More In Serial Cables - Page 9. 1.When using AirsFish Magsafe to Usb C adapter to charge MacBook 15" 87W in the output power of 45W, it will charge at a slower rate and may product some heat (which is expected, the normal temperature is from -4℉ to 149℉) particularly when running high CPU intensive task. 2.Max power output is 60W when the input is 85W power adapter. Max power output is 45W when the input is 45W/60W power adapter. 3.The LED in MagSafe adapter will not light up when charging with the AirsFish Magsafe to Usb C converter adapter. For all of AirsFish items, customers have 18-month warranty, during this 18-month warranty, AirsFish supports free replacement or full money back and 24 hours professional service, and we always provide friendly, easy-to-reach support (except for human factors, improper application and maintenance, or unpredictable disasters). 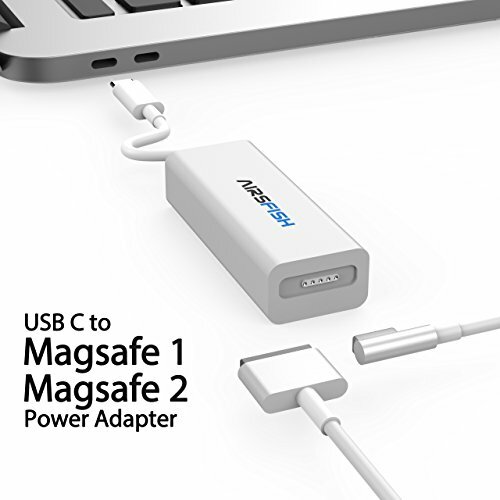 This Usb Type C to Magsafe power adapter item is a great option to bring back the functionality of MagSafe 1 and MagSafe 2 and allows older users to recycle their old MagSafe 1 and MagSafe 2 adapters. Magsafe end compatible with: 45W, 60W, 87W power charger adapter. Pls note: Max power output is 60W when the input is 85W power adapter. Max power output is 45W when the input is 45W/60W power adapter. Usb Type C end compatible with: MacBook, MacBook Pro, Nintendo Switch, Samsung S8, Google Pixel, and other mobile phones/laptops/tablet PC/PPS and other devices which with the Usb Type C ports. The Maximum Output of this item is 45W~60W, It supports MacBook Pro 15"(87W) and the Power Supply of Thunderbolt and Cinema Display. But a little bit slower charging than your original USB-C adapter , however, slower charging is better for the protection of the battery. This item built-in self-developed smart chip supports the latest USB C Power Delivery & PPS protocol, Automatically recognize the end device needed power and adapt the voltage and current to best suit the end device charging purpose, range from 5V@3A 9V@3A 12V@3A 15V@3A 20V@2.25A and PPS 3-12V@3A MAX (PD 3.0 Support). If you have any questions about this product by AirsFish, contact us by completing and submitting the form below. If you are looking for a specif part number, please include it with your message.